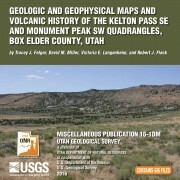 The Kelton Pass SE and Monument Peak SW 7.5′ quadrangles (NW Utah) are located entirely within southern Curlew Valley, which drains south into Great Salt Lake, and extends north into Idaho. Bedrock exposures form the Wildcat Hills and two small shield volcanoes. Exposed rocks and deposits are Permian to Holocene in age and include sandstone of the Permian Oquirrh Formation, tuffaceous sedimentary rocks of the Miocene Salt Lake Formation, Pliocene basaltic and dacitic lava flows, Pleistocene rhyolite and basalt, and Pleistocene and Holocene surficial deposits of alluvial, lacustrine, and eolian origin. Structures related to the Miocene Raft River detachment fault and Basin and Range extension also are present. New geophysical data and interpretations and new geochronology data for volcanic units improved insight into the tectonic and volcanic evolution of the area. The Kanarraville quadrangle includes the southern part of Cedar Valley and parts of the adjacent Kolob Terrace, Harmony Mountains, and North Hills. It straddles a particularly instructive area of structural overlap between the Sevier fold thrust belt-represented by the overturned, east limb of the Kanarra anticline exposed at the west edge of the Kolob Terrace-and the Basin and Range physiographic province, whose east margin corresponds to the Hurricane fault zone at the base of the plateau. Regional ash-flow tuffs erupted from calderas in western Utah and eastern Nevada are present in the Harmony Mountains and North Hills; in the Harmony Mountains, these tuffs are involved in a large gravity slide shed off the nearby Stoddard Mountain laccolith, which erupted to produce an ash-flow tuff now partly buried by the gravity slide. 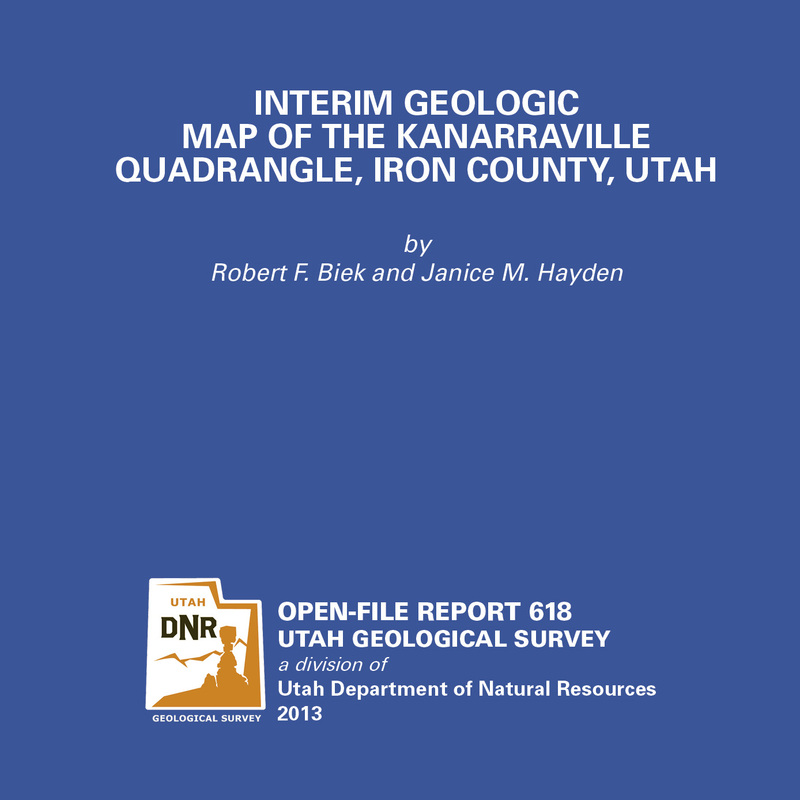 This CD contains the geologic map at 1:24,000 and a 31-page booklet describing the geology of the Kanarraville 7.5-minute quadrangle. All of the files are in PDF format. The latest version of Adobe Reader is required to view the PDF files. 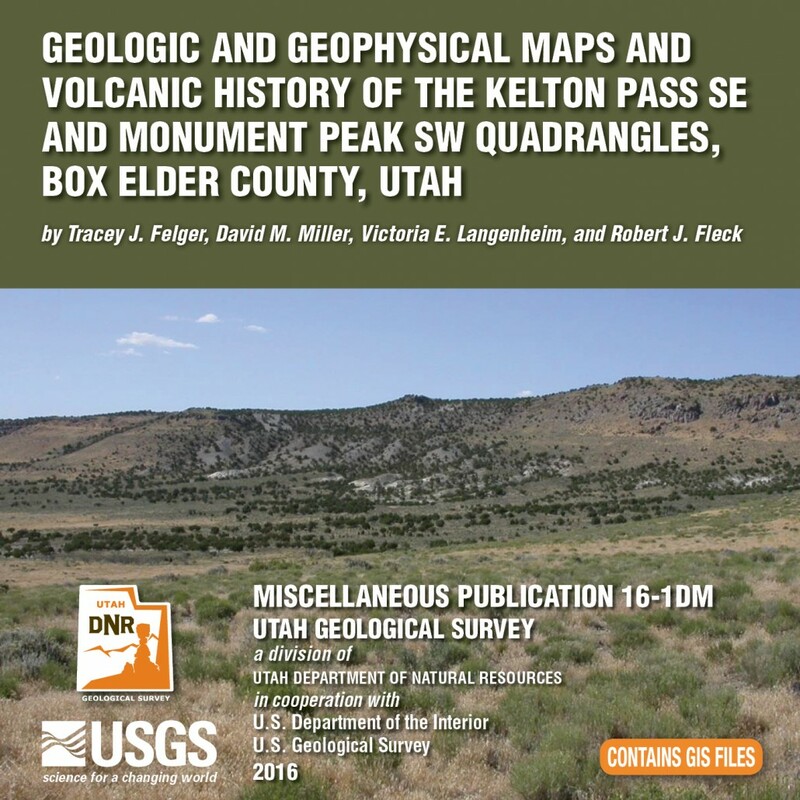 This report makes available raw analytical data from laboratory procedures completed to determine the geochemistry of rock samples collected during geologic mapping partially supported by the Utah Geological Survey (UGS). Additional information about these samples is available in Biek and others (2009) and Christiansen and others (2007). These data were prepared by Brigham Young University, Department of Geological Sciences, under contract to the UGS. These data are highly technical in nature and proper interpretation requires considerable training in applicable geochemical techniques. 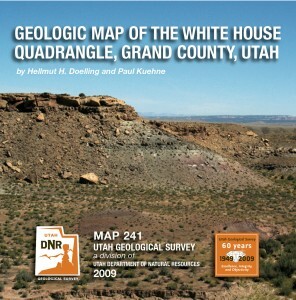 The White House quadrangle is located northeast of Arches National Park in eastern Utah. Exposed strata range from Late Jurassic Brushy Basin Member of the Morrison Formation to Late Cretaceous Mancos Shale. The quadrangle overlies the ancestral Paradox basin and is influenced by salt-related folds, including the Salt Valley anticline to the west and Cisco Dome to the east. The Thompson Springs quadrangle is located north of Arches National Park in eastern Utah. Exposed strata range from Early Cretaceous Cedar Mountain Formation to Late Cretaceous Castlegate Sandstone. The quadrangle overlies the ancestral Paradox basin and is influenced by salt-related folds, including the Salt Valley anticline to the west and Cisco Dome to the east. The Provo 7.5′ quadrangle covers east-central Utah Valley and includes Provo, the third largest city in Utah. Hobble Creek, the Provo River, and Spanish Fork are the primary streams in the quadrangle, flowing westward from the Wasatch Range to the Provo Bay portion of Utah Lake. U.S. Interstate Highway 15 extends from north to south through the map area. 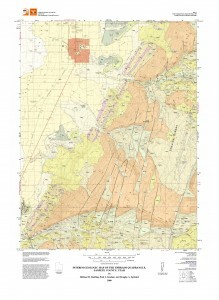 Included are two plates—a geologic map at 1:24,000 scale and an explanation sheet. 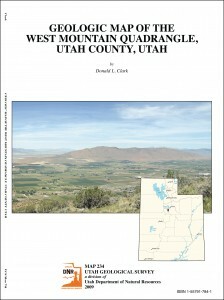 The West Mountain quadrangle covers West Mountain and parts of Utah and Goshen Valleys along the Interstate 15 corridor. Improvements were made to the bedrock structure and stratigraphy, and to mapping of Quaternary surficial deposits. The mountain consists of folded and faulted Paleozoic strata, largely of the Oquirrh Group. The valleys are mostly covered by Quaternary deposits related to the Bonneville lake cycle, as well as by some younger deposits of Utah Lake and other surficial processes. A large aggregate quarry is located at the south end of the mountain at Keigley. 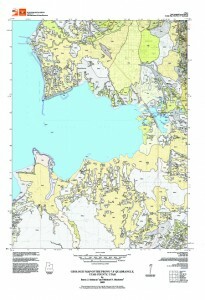 This map is part of ongoing work by the UGS to complete a regional-scale map of the Provo 30′ x 60′ quadrangle.